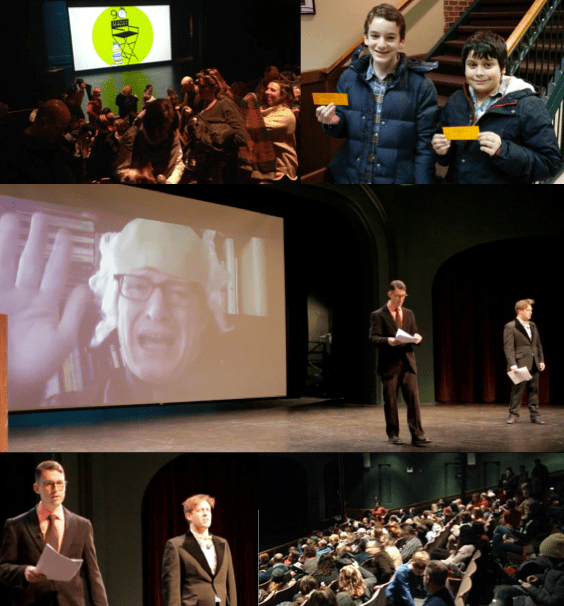 90-Second Newbery Film Festival: Bay Area Screenings 2015! Just got back from a whirlwind visit to beautiful San Francisco and Oakland, California! It’s always great to go there, because I have the privilege of staying with my friends Alisha and Sharon (an amazing chef who owns the must-visit San Francisco restaurants Gialina and Ragazza). My business in the Bay Area? Last Saturday we did back-to-back screenings of the 4th annual 90-Second Newbery Film Festival at the San Francisco Public Library and the Rockridge branch of the Oakland Public Library. Unfortunately I don’t have many pictures, but gigantic thanks to Leah of the Rockridge branch, a young girl who stepped in at the last minute to rock it as my co-host there! She was natural, a real pro! Thanks also to Nina Lindsay and Erica Siskind who set up the screening, too. I’m looking forward to lots of entries from Oakland next year. On the San Francisco side, thanks to Annie Barrows (author of the Ivy and Bean books), who nailed it as my San Francisco co-host. My daughters Lucy and Ingrid are fanatics for the Ivy and Bean books, and I showed a short video to Annie and everyone in which they made their love of those books plain. Annie’s in the lower right picture in the above collage, in between me and Carla Kozak of the San Francisco Public Library—Carla and Christy Estrovitz were the librarians who made the SFPL screening happen, thanks to you both (and thanks for the toffee)! Also thanks to Summer Dawn Laurie and Katherine Megna of Books Inc., who kindly sold books after the show. After a few years of doing this film festival, they’ve become true friends (and Katherine is the one who has a tattoo of a line from my book The Order of Odd-Fish, no joke! How cool is that?!). Great work! We brought the filmmakers Alex and Ankith onstage when we showed this movie, and the crowd gave them the applause and recognition they deserved. 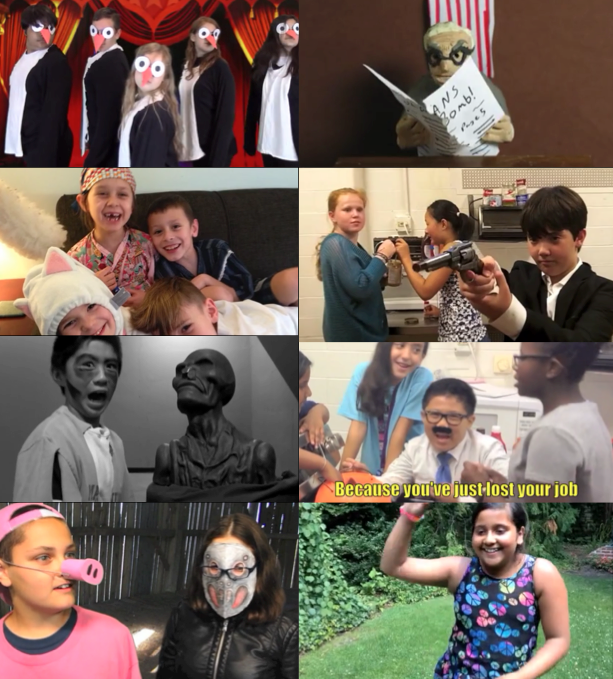 Thank you to all the young filmmakers who made this the best 90-Second Newbery yet. Here’s a montage of all the movies we showed in San Francisco. Looking forward to next year! Next up on the 90-Second Newbery tour: Portland, Tacoma, Minneapolis, Manhattan, and Brooklyn! Looking to make your free reservation(s) to these screenings? Find all the details here. San Francisco and Oakland! The 90-Second Newbery is coming to you Saturday, February 7, 2015. Make your reservations now! You can find all the information on our Events Page. Just as last year, the students were talented, energetic, and committed to making great stuff. It was hectic, but looking back, what fun! The students mostly wrote their own scripts, did most of the camerawork, handled their own acting, and did their own editing! My only hard-and-fast rule: I demanded movies that went beyond merely summarizing the book. I wanted the movies to be produced in some weird or iconic cinematic style that would transform the story. And boy, did our students (Gavin, Dami, Quinton, Sadie, Sheridan, “Catwoman,” “Bob,” and Elleson) ever deliver! For instance, everyone remembers Beverly Cleary’s 1978 Honor Book Ramona and Her Father. Ramona’s father Mr. Quimby loses his job and gets depressed. Ramona tries to make her father stop smoking. The family’s nerves are strained. The Quimbys do have one nice night carving a pumpkin, but then their cat Picky-Picky devours and ruins the pumpkin in the middle of the night. Mr. Quimby eventually gets a new job. Great work! Gavin’s mustache is immortal, and I love how he dances “the worm” at the end. Everyone really sold the singing, too! No mumbling or shrinking violets here, I love it! The emoting in the scene when they discover Picky-Picky has destroyed the pumpkin is intense, especially with “Bob.” I love how “Catwoman” sells the most depressing takeoff ever on Pharrell’s “Happy”: “Clap along if you feel hopeless even though you’ve tried your best.” And Dami does a great job keeping everything emotionally grounded as Ramona. Great performances and singing all around. This one killed at the Chicago screening! That’s not the only adaptation of Ramona and Her Father that the CTD did. But how do you answer a musical? By going all the way into the hyperspace of weirdness: by adapting Ramona and Her Father in the style of James Bond! Wait what?! But when you think about it, it makes sense. What if Ramona’s father was James Bond? And instead of losing his normal job, he was sacked from MI6? And their cat Picky-Picky was actually a secret agent working for Blofeld? And when Ramona feels insecure about her sheep costume at the Christmas pageant, it’s Blofeld who has the better sheep costume? It makes sense: all those punning double entendres that James Bond makes are, at bottom, painful dad-jokes. What if James Bond’s family was as exasperated with him as the Ramona’s family was exasperated with Mr. Quimby? Of course that’s how would James Bond carve a pumpkin! I love the way the family reacts with perfectly reasonable scorn to all of Bond’s would-be puns and witticisms. The way Sadie delivers “Drive on the right side of the row, we’re in America” is priceless. Picky-Picky explodes with hilarious gratuitousness, and the trick photography in making Quinton fight himself, as he plays both Bond and Blofeld, is ingenious! And of course it’s hilarious the way the whole family deserts him at the end, as he’s too thick to realize what the letter means . . . So much for Ramona and Her Father. The CTD kids adapted another Newbery classic, Kate DiCamillo’s 2001 Honor Book Because Of Winn-Dixie, which is all about how a newcomer girl to a small town befriends a rambunctious dog she finds tearing through a Winn-Dixie grocery store. She names it Winn-Dixie and adopts it as her own, but the mischievous dog pulls her along on one adventure after another, the effects of which end up bringing the whole town together. Now, how do you tell that story in a distinctive way? Well, how about instead of doing it from the point of view of Opal . . . doing it from the POV of the dog Winn-Dixie? I love the way Winn-Dixie ransacks a store! Great work with the “puppy-cam” that includes the nose and paws in as many shots as possible (my wife says it looks like it’s from the POV of Predator). I love “Bob’s” insane scream when she thinks Winn-Dixie is a bear, and “Catwoman’s” eyerolling response to her puns about bears being “unbearable.” I love the way Elleson sells her jar of “peanut butter” (that is clearly a mislabeled jar of pickles). The idea gets pushed all the way through the movie, consistently and ingeniously! I loved the enthusiasm and energy Sadie brought to her role here. Good set-up and payoff with the thunder storm. Everyone’s bringing their acting A-game, from Dami’s sincere Gloria Dump to Sheridan’s plucky Opal to Quinton’s disengaged father. Well done! Great job, kids of the CTD! I’m looking forward to sharing selections from these videos with everyone at the screenings!